Continuing education credits accepted by ARRT* and NMTCB for nuclear medicine techs. All courses on this site offer Category A credits which are good for your NMTCB and ARRT CE requirements*, and are accepted by every registry in the USA, US territory, Canadian province, and all other Radiologic Technologist, Nuclear Medicine, and Ultrasound Technologist registries in North America for both full and limited permit technologists, guaranteed. Choose a course below with the number and type of credits you need to find out more. 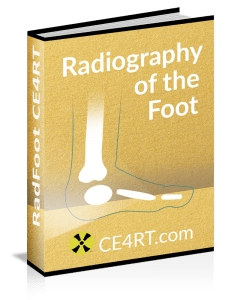 A four credit digital radiography course. Covers radiation protection for all technologists as well as digital requirement for California techs. A full 20 Credits good for ARRT and all but 3 states. Be advised, this course does NOT offer full credit for the CA, FL, and TX STATE registries. Technologists practicing nuclear medicine need CE credits for either ARRT or NMTCB. Here are some answers to frequently asked questions. I have primary certification and/or registration in Nuclear Medicine Technology through ARRT or NMTCB. Do I need CE (continuing education) compliance? Yes, CE compliance is required for primary certification and/or registration in Nuclear Medicine Technology obtained through ARRT or NMTCB. What is the process for maintaining Nuclear Medicine Technology credentials after I earn them? In order to maintain credentials and remain ARRT certified, technologists must complete a renewal process every year and comply with CE requirements every two years. Additionally, technologists who were credentialed on or after January 1, 2011, must complete CQR (continuing qualifications requirements) every 10 years to maintain their credentials. I have passed the NMTCB certification examination. What do I have to do to maintain an active certification status? If you are an NMTCB-certified technologist, to maintain active certification, you need to complete an annual renewal statement that includes ethics questions and a signed declaration that you have complied with the CE policy. Continuing education requirements are deemed to be complete when a technologist has documentation of 24 acceptable credits every two years. An annual renewal fee is also payable to maintain active status. I graduated from school many years ago. Can I still become NMTCB certified? If you graduated from an accredited Nuclear Medicine program within the last five years, you can take the entry-level examination conducted by the NMTCB. If you need a confidence boost, there are several courses available at CE4RT.com to review what you learned in school. When is the deadline for renewal of certification and registration with ARRT? The annual renewal deadline is different for each technologist. Your deadline is the last day of your birth month. So, if your birthday is on June 20, your deadline for annual renewal of ARRT certification and registration is June 30 every year. Renewal can be done online through your ARRT account. You will need to complete an Application for Renewal of Certification and Registration and pay the renewal fee. Credentials are only renewed if the R.T. has complied with biennial CE requirements. How do I comply with the ARRT’s CE requirements? ARRT CE requirements are linked to a two-year period called a biennium. R.T.s are required to complete 24 CE credits every two years. These credits must be Category A or Category A+ credits. Each credit is equal to one hour of education. To complete the required 24 credits, a technologist must therefore attend 24 hours of CE activities. Most state agencies follow this system as well. CE activities can include lectures, classroom courses, online learning, conferences and seminars. Do I have to obtain a specific number of CE credits from lectures, classroom learning, and/or online courses? The ARRT does not currently place any restriction on the type of CE activity to be completed by a technologist, provided the activity is ARRT-approved as Category A or A+. What are Category A and A+ credits and how are they different? CE activities must be approved by RCEEM or RCEEM+ organizations (Recognized Continuing Education Evaluation Mechanism). These organizations evaluate the quality and content of educational activities and assign them as Category A or Category A+. ACR, AIUM, and SDMS have RCEEM status and can assign Category A to CE activities. The ASRT has RCEEM+ status and can assign Category A+ to CE activities. Do Nuclear Medicine Technologists require Category A or A+ credits? Nuclear medicine techs must complete Category A credits to comply with ARRT’s CE requirements. Category A+ activities are accepted but not necessary. How can I tell whether a CE course is Category A or A+ approved? RCEEM, RCEEM+ or ARRT-recognized state licensing agencies must approve all courses and assign them as Category A or A+. Before participating in a continuing education activity, technologists should confirm RCEEM approval through written documentation clearly indicating the course is a Category A credit. It is a good idea to check the list of NMTCB-approved CE organizations. I took academic classes in college. Do they count towards ARRT CE credit? Academic courses can be claimed as CE credits provided they meet the ARRT criteria for content. You can claim 12 CE credits per quarter hour course and 16 CE credits per one semester hour course. If you plan to claim college courses towards CE requires, it’s wise to verify this with the ARRT or state registry beforehand. Does an additional certification count towards ARRT CE requirements? Additional certifications obtained prior to January 1, 2018, were considered equivalent to 24 CE credits. However, any certification earned after 1/1/2018 will no longer count towards any CE credits. What are the NMTCB CE requirements for Nuclear Medicine Technologists? The NMTCB requires Nuclear Medicine Technologists (CNMTs) to demonstrate continued competence by completing 24 hours of approved CE activities in a two-year cycle. This translates to 1 credit per month. Credits must be earned in the current reporting cycle and extra credits may NOT be carried over to the next two-year cycle. There is one exception to this rule. Newly certified technologists only need to obtain CE credits based on the actual number of months in the first CE cycle. For example, if a technologist obtains initial certification on November 15, 2018, and their birthday is June 20, the first CE cycle will run from November 1, 2018, to May 31, 2020, a period of 19 months, and during this cycle only 19 credits need to be completed. For the subsequent biennium of 24 months from June 1, 2020, to May 31, 2022, the regular 24 credits will be needed. Are college courses and ACLS training recognized as NMTCB CE credits? Passing an additional examination offered by the NMTCB (NMAA, PET, NMTCB (CT), NCT) or ARRT (CT, MRI) or AHRA (management) is considered equivalent to 24 CE hours. Courses in Nuclear Medicine Technology, patient care, and radiological health sciences completed at post-secondary institutions with a grade C or higher qualify for CE credit. Courses in business management, technology, and education may also be considered. One semester college credit is equivalent to 16 CE credits and a quarter college credit is equivalent to 12 CE credits. Completion of ACLS (advanced cardiac life support) and PALS (Pediatric Advanced Life Support) qualifies as 6 CE credits per two-year reporting period. If both these courses are taken, the technologist can claim a maximum of 9 CE credits per two-year period. BLS and CPR (basic life support and cardiopulmonary resuscitation) training does NOT qualify for the CE requirements of the NMTCB. Do CE activities need to be specific to my certification in Nuclear Medicine Technology? The underlying philosophy for continuing education is that technologists are best qualified to determine the type of CE activity that will benefit them. There is no rule that CE activities should be specific to a particular discipline, but CE topics should be selected relevant to a technologist’s area of practice to ensure continued professional competence. I am certified in multiple disciplines. Do I need to complete additional CE for each credential? ARRT CE requirements are independent of the number of credentials held by an R.T. Additional CE credits are not required for separate disciplines. As noted, however, CE activities should be related to the technologist’s areas of practice. What is the CE reporting period for the ARRT? The ARRT has a biennial (two year) reporting period for CE activities. This two-year period is linked to the technologist’s birthday month. The biennium starts on day 1 of the birthday month and is completed after two years on the last day of the month preceding the birthday month. The next biennium begins when the prior biennium ends. For instance, if your birthday is on June 20, the biennium assigned to you will be from June 1 of this year to May 31 two years later. The biennium assigned to a technologist is mentioned on the renewal application. CE credits must be completed and reported to the ARRT between these dates. What is the NMTCB biennial CE cycle? The NMTCB biennial (two-year cycle) is based on the technologist’s birth month and is assigned on an even- or odd-year basis. The CE credits required must be obtained during the CE cycle and reported on the annual renewal statement. If a technologist is first certified in an even numbered year, the first CE cycle starts on the first day of the certification month and continues until the last day of the month preceding the technologist’s birthday month in the next even numbered year. For example, if a technologist is certified on November 15, 2018, and their birthday is June 15, the first CE cycle will run from November 1, 2018, to May 31, 2020. The subsequent CE biennium will run from June 1, 2020, to May 31, 2022, and during this period of 24 months, the R.T. must obtain 24 CE credits. Can I carry extra CE credits to the next biennium or CE cycle? No. The ARRT does not permit credits to be carried forward to the next biennium. The NMTCB also does not allow technologists to carry over extra CE hours to the next CE cycle. At the completion of a two-year period, all CE credits earned in that two-year period become invalid for future reporting. I want all my CE cycles with different organizations to match. Is it possible to alter my ARRT or NMTCB CE reporting cycle? Biennium dates are assigned according to the R.T.’s birthday month by both the ARRT and the NMTCB. The ARRT does not permit technologists to change the month when the biennium begins and ends. However, the ARRT does consider a technologist’s written request to change the start/end years. The NMTCB permits a one-time change in biennium dates from odd to even year or vice versa. The technologist must submit a NMTCB CE Cycle Change Request Form for this purpose. Once a change has been made, any further requests for a change in CE cycle will be denied by the NMTCB. SLAs (state licensing agencies) have their own rules. Can CE credits be completed in advance before the next biennium? The CE reporting period is important in terms of earning and reporting continuing education activities. Both the ARRT and NMTCB require the credits to be earned within the current biennium. Credits cannot be obtained before the biennial begins or after the biennial ends. The dates for the biennium are indicated on the R.T.’s credential card. CE activities can be reported to the ARRT no earlier than two months before the biennium begins and no later than one month after the biennium ends. I am a newly certified RT. When do ARRT CE requirements begin for me? After taking the examination, CE requirements become applicable from the first day of the next birthday month. If a technologist received initial certification in November 2018 and their birthday is in October, the first CE biennium will run from October 1, 2019, to September 30, 2021. The biennial reporting period is maintained even if a technologist becomes certified in additional disciplines. How do I report my CE credits to the ARRT? Technologists must submit an application for registration renewal towards the end of the biennium. This must be done before the biennium ends. CE credits earned in the current biennium should be listed on the report form that is a part of the application for renewal. State licensing agencies have similar requirements structured around the ARRT reporting system. What documentation is required to report NMTCB CE credits? Technologists are responsible for maintaining a record of their CE activities. Documentation from NMTCB-approved CE sponsors includes the date, title of course, reference number, and number of CE credits. Academic course documentation includes transcripts from an accredited post-secondary institution indicating the course title, number of credits, and grade awarded. ACLS/PALS documentation includes a dated, signed copy of the certification card. Will the ARRT or NMTCB maintain a record of my CE activities? The ARRT will NOT keep a record of your CE credits. You are responsible for maintaining your own records. The NMTCB also holds technologists responsible for keeping a record of their own CE activities. Most state licensing agencies also follow the same rules and expect the technologist to keep track of their educational involvement. You should keep documentation of the courses you have taken. Records of courses purchased here at CE4RT.com are available for retrieval at any time online. I am on active military duty overseas. Will my CE requirement be waived? The NMTCB waives CE requirements for technologists on active military duty and deployed overseas. A military waiver form needs to be completed and submitted to the NMTCB office along with your deployment orders. Does CE4RT.com report CE courses I have taken to the ARRT or NMTCB? No, we do not report CE activities to the ARRT or NMTCB. It is your duty to submit CE credits to these agencies and/or the state licensing agency you are registered with. CE4RT.com does report to the state licensing agency in Florida, but technologists must report the CE credits themselves also. Are copies of previous CE courses I took at CE4RT.com available? Documentation for every course completed here at CE4RT.com is accessible online. We do not currently have a system to record CE credits obtained elsewhere, but this is under consideration for the future. I received applications training on-site at my facility. Will this be recognized as compliance with ARRT CE requirements? A maximum of 8 credits are permissible per biennium from on-site applications training at a facility where the technologist works. Anything in excess of 8 credits through on-site applications training will not be claimable towards the ARRT CE requirements. Off-site applications training is NOT capped at 8 credits, however. An approved provider must issue the documentation indicating completion of applications training. I was unable to complete CE requirements within the biennium. Do I need to complete any penalty credits? If a technologist applies for ARRT registration renewal without completing the required CE or with incomplete documentation of CE involvement, he/she is automatically put in “probation”. The probation period lasts six months starting on the first day of the technologist’s birthday month. The technologist can complete CE credits during the probation period without the need to obtain any extra (penalty) credits. Once the required CE activities have been completed, the R.T. must fill out a probation report form and submit it to the ARRT along with a $50 fee. The probation status is removed after verification of compliance with biennial CE requirements. The technologist is issued a new credential card. If CE requirements have not been met by the end of the six-month probation period, ARRT certification is discontinued and reinstatement can only be considered per current ARRT Rules and Regulations. I took a course at CE4RT.com and passed the exam. Does it count for CE credit immediately? Yes, when a technologist passes an exam for one of our courses, the time of passing is recorded and a certificate of completion is issued. This certificate is available for verification by the NMTCB, ARRT, or state registry. Once you pass an exam at CE4RT.com, you are instantly compliant with the number of credits indicated on the course and documented on your certificate. It is your responsibility, however, to report this activity to the ARRT, NMTCB, or state agency. I have received notification that I am being audited by the ARRT. What does this mean? The ARRT occasionally audits the CE activities reported by an R.T. This means the CE credits you reported will be officially verified for authenticity. If you do not respond to an audit request, the ARRT will revoke your certification. You may have been selected for a CE audit due to inconsistencies in the reporting form you submitted. In such cases, the ARRT performs the audit to verify your compliance with CE requirements. Sometimes, a technologist is selected for CE audit on a random basis. The audit process is relatively uncomplicated. As noted, you are responsible for retaining copies of all the CE certificates that you report to the ARRT. If you have received notification of an audit, all you need to do is submit copies of the certificates. There is a code on the certificate that the ARRT will use to verify the authenticity of the credits you have claimed. CE4RT.com welcomes any request for verification of CE credits earned through completion of courses at our website. What is an NMTCB audit? The NMTCB conducts CE audits in a number of cases. Technologists who indicate that they have not met CE requirements by the specified biennial date are automatically audited and do not receive a certification card. In addition, the NMTCB randomly selects some technologists for an audit each year. If you are notified that you are being audited, you must submit documentary proof of educational activities completed. This must be sent in within 60 days of the postmark on the audit notification letter from the NMTCB. The NMTCB reserves the right to request copies of your CE certificates. Submitting false documents can result in monetary fines, disqualification from examinations conducted by the NMTCB, and revocation of your certification. Are copies of VOICE transcripts from SNMMI or ECE reports from ASRT acceted by NMTCB during an audit? Yes, the Society of Nuclear Medicine and Molecular Imaging (SNMMI) and ARRT have a credit transfer system they call "VOICE" If a technologist is audited, they can submit a VOICE transcript from SNMMI or earned continuing education (ECE) report from ASRT or CE transcript from approved states licensing agencies. VOICE is a joint credit sharing program developed along with the Society for Nuclear Medicine. You can sign up for VOICE at www.snmmi.org. If you are audited by NMTCB, they will first check your records in VOICE, and if you are found in compliance, you do not need to respond to the audit. However, if CE requirements remain unverified through the VOICE program, you will need to provide documentation of CE activities to the NMTCB. I missed the NMTCB audit deadline. What happens now? If a technologist is unable to document their CE activities within 60 days of an audit notification, they are put on probation for six months. During the probation period, the technologist must obtain 24 new and additional credits. The credits earned to meet the probation requirements will NOT count towards the next CE cycle. In addition, the technologist must pay a $65 fee and any outstanding renewal fees. If the technologist does not comply with the additional CE requirements during the six-month probation period, the NMTCB will send a notice of non-compliance and suspend the technologist’s credentials. The technologist will have a further six months from the date of suspension to submit necessary documentation, barring which the credentials will be revoked. Reinstatement can only occur by completing the entry-level exam and meeting other current eligibility requirements. I let my NMTCB certification lapse. What should I do? If you have been inactive for less than five years, you can reactivate your NMTCB certification by paying back dues up to a maximum of current examination fees, in addition paying a $65 reactivation fee, and by providing documentation of 12 CE credits for each year you were inactive. If you have been inactive for more than five years, your certification has permanently lapsed. You must pass the entry-level examination again and submit a new application to the NMTCB according to current eligibility requirements. Why do I need to take an exam after completing a course at CE4RT.com but not after attending a lecture? You need to take an exam for a course completed on CE4RT.com to comply with ARRT requirements. The test is a verification of your participation in the course and your understanding of the course material. When you attend a lecture, your participation is documented through the attendance record and a test is not needed. I have unanswered questions about CE requirements for Nuclear Medicine technologists? You can get more information on ARRT CE requirements and NMTCB CE requirements on their websites. Give us a chat, text, or call and we will be happy to try and help you out.